Most types of fish can be thrown into a taco, but each kind works best with a different set of toppings. 1. White-fleshed, mild, saltwater fish. Whether snapper, mahi mahi, grouper, flounder, halibut or cod, wild, local fish are the tastiest choice for Baja-style tacos. Since these fillets tend to be expensive, keep the toppings simple (think raw shredded cabbage and guacamole) so the mild flavor of these fish can really shine through. Double check the Monterey Bay Aquarium’s site to make sure the fish you’re buying is sustainable in your area. 2. Salmon. 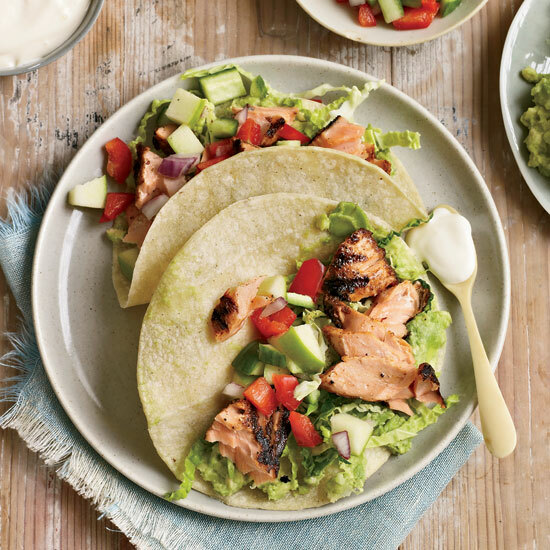 Salmon isn’t necessarily traditional, but there’s no reason you can’t wrap it in tortillas. Because the fish’s flavor is stronger, it can stand up to spicy rubs as well as the charring heat of the grill. 3. Farmed freshwater fish. At US taco shops and trucks, you’ll often find fish tacos made with tilapia or maybe even catfish. These can be a sustainable choice, for sure, but the fillets can have a murky, muddy flavor that’s best covered up with lots of vibrant toppings. (For example, this is where you use that mango-tomato salsa).